21st August to 4th September 2016. Trade has always been stimulus for the UK! In this time of uncertainty with Brexit, trade continues to be a hot topic and an issue that all want to debate. This exhibition intends to explore through a visual narrative some of the themes of trade that encompass our rich culture. We have a rich tapestry of colours, tastes and sensations, this is down to trade and our openness to it. We needed gatekeepers and enhanced points of service for this arena to take place; St Katharine Docks is such a platform and deserves our thanks for its history. 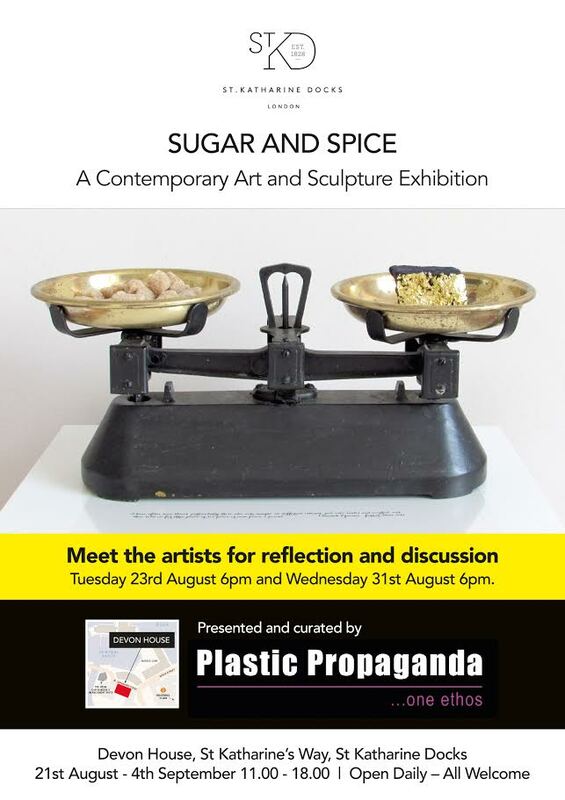 Sugar and Spice contains themes (some hard hitting) of the effect of trade has had on our economy and culture. This acts not only as a guide but also a barometer of how and why we are. Artists have shown throughout history that this subject, often political, cultural and painful is a rich subject to create, document and explore through the Artifact. Both artists such as Anish Kapoor, Chris Offili, Kara Walker, Yinka Shonibare and also museums that prospered such as the V & A, British Museum and the National Gallery are all a legacy of trade. Once you view the exhibition and sit down with your coffee, while eating a banana bread, perhaps think of the journey that got these items here, the human endeavor, pain and suffering, think on the education, the enlightenment that has come from overseas and as an Island country what we have benefitted from the notion of the big wide world! We have a rich legacy which looking back informs, educates and gives us the platform for continuous debate. This exhibition lets us celebrate our history, recognise our mistakes and explore our future potential.